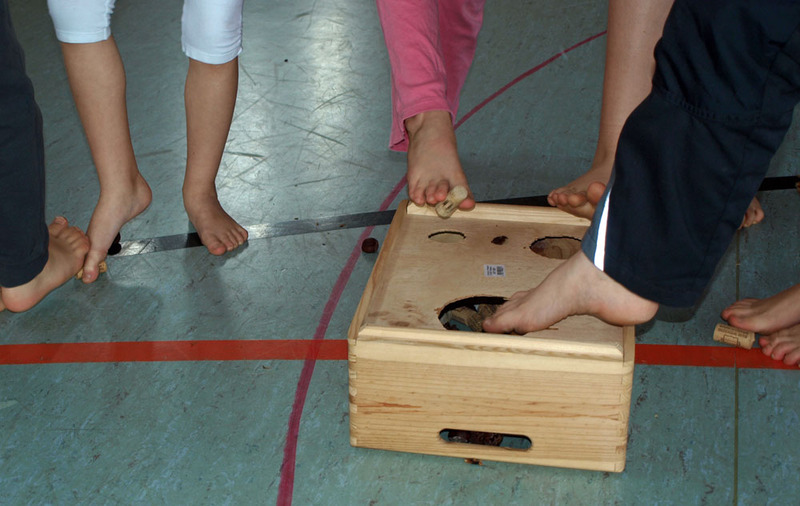 With an easily available selection of objects, a variety of foot gymnastics games can be performed. This promotes health and physical competence in a way that is lot of fun. The exercises are listed here in an order recommended for PE classes. The entire program as described here takes about 90 min, for shorter lessons select appropriate parts. Participants sit down and put their hands next to their feet. For preschool and primary school children, it is now a good start to let them name the similarities and differences between hands and feet. Of course, we can move apart the fingers quite far. But also try to spread out the toes like a fan! Perhaps we even can fold fingers and toes together. And as our feet are so skilled, we are going to play all the following games without using the hands! 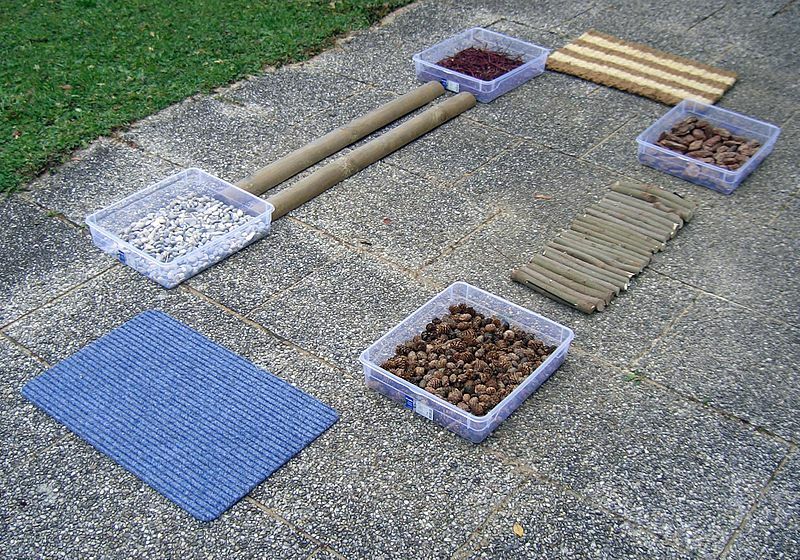 A small barefoot path with different materials can be easily arranged and requires only little space to store. Doormats of different texture, a few boxes filled with various materials, two half-round wood logs such as fence pickets - more is not needed. 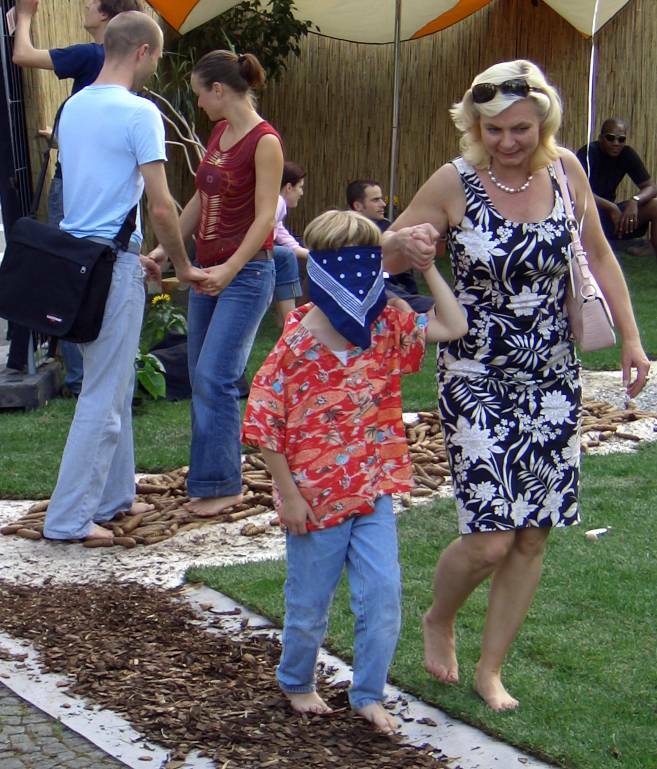 At first, participants walk slowly on the path to feel the substrates. Then participants are blindfolded or guided backwards to recognize and name the different materials without seeing them. They are directed to the sensation fields in a random order to make the game more challenging. Now the sense of balance comes into play. 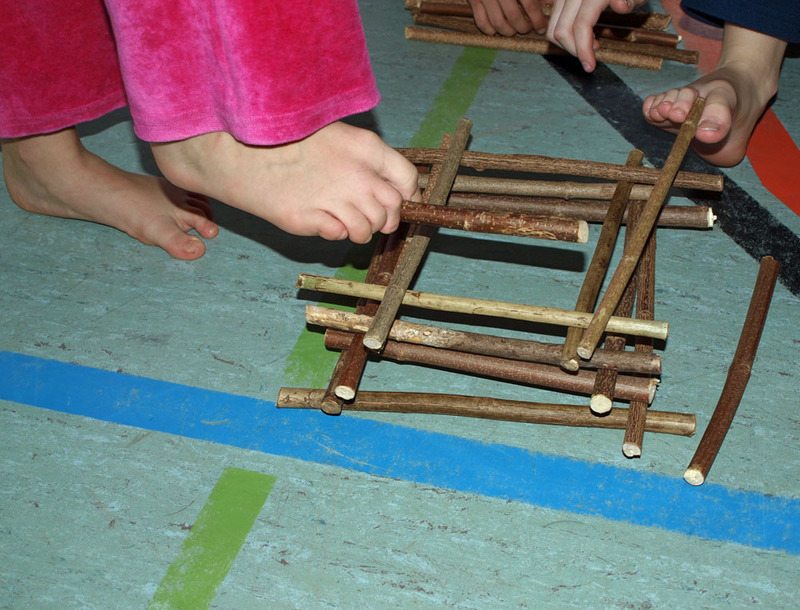 The half logs are placed behind each other to form a balance beam. Balance first on the whole foot, then on toes! It is a little more difficult to stand on the bar - on one leg or with both feet one after the other. And real artists can also balance backwards or even with eyes closed. After concentrating so much, it is time to move! A line is formed by putting the hands on the shoulders of the man in front. 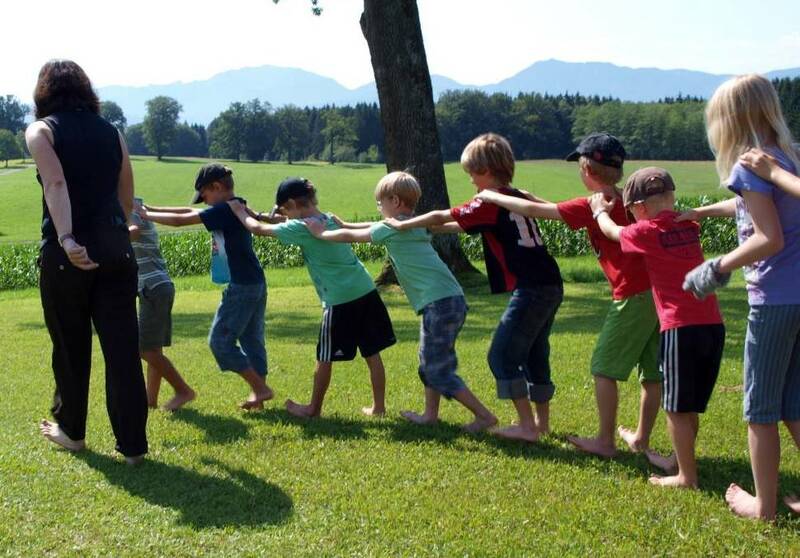 The group goes on to find an even pace, then walks on tiptoes, normal again, on heels, on the outer and inner edges of the feet, normal, gradually down to the duck walk, slowly back up, walk lifting legs like a stork, then with legs apart, balance on a line on the ground, walk backward, sideward. Try all these variations also on tiptoes and heels! 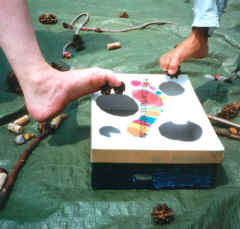 To start the following sequence of exercises, each participant is given various objects under the feet by a partner and has to recognize them with his eyes closed. 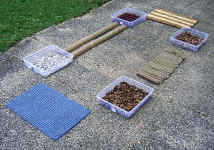 Flexible toes easily grab at small stones, nuts, pine cones etc. and put them elsewhere, e.g. through holes in the cover of a box. 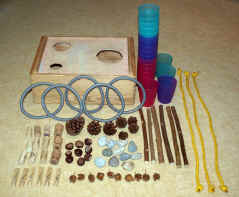 If all objects are gone, the box is emptied again for further practice. Then the box is placed a few yards away, and the objects must be transported by jumping on one leg. As with the following games, the participants should exercise alternately with both feet. Pick up rings of soft material (e.g. 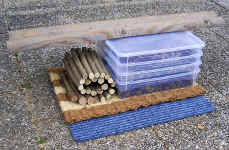 insulating foam, pipe cleaners, diameter 4 to 6 inches) with the toes and thread them onto a vertically positioned stick. Alternatively put a ring on the outstretched foot of another player. The next person can take it again and pass it along the same way. It is not difficult to hold a stick (approx. 12 inches long ) between the toes, but it requires some attention to pass it to other persons without dropping it. 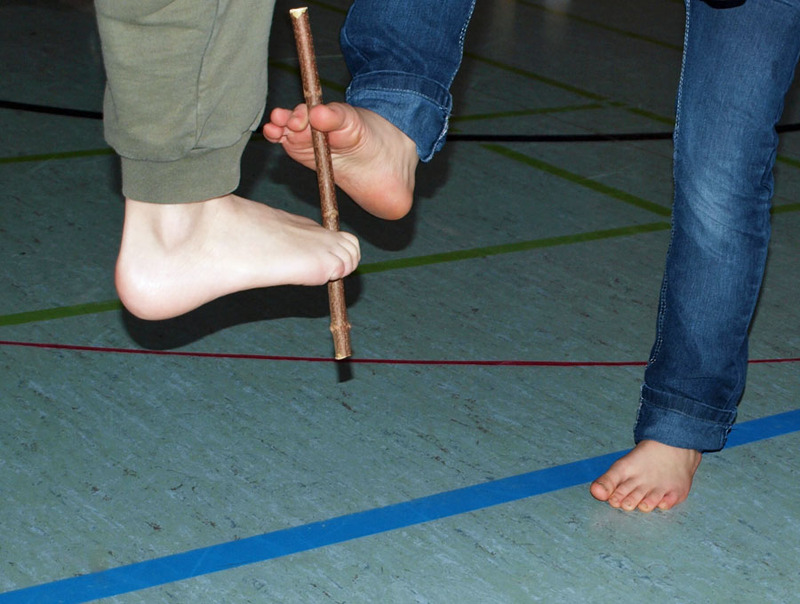 First practice this in small groups, then arrange a competition of two or three lines of people who on command shall pass the stick from foot to foot as fast as possible - and back through the row with the other foot. If the rod falls, the penalty is to put it back by two persons before resuming the race! A further challenge is to place the players at a few yards distance and let them jump this way on one leg with the stick between the toes of the other foot. 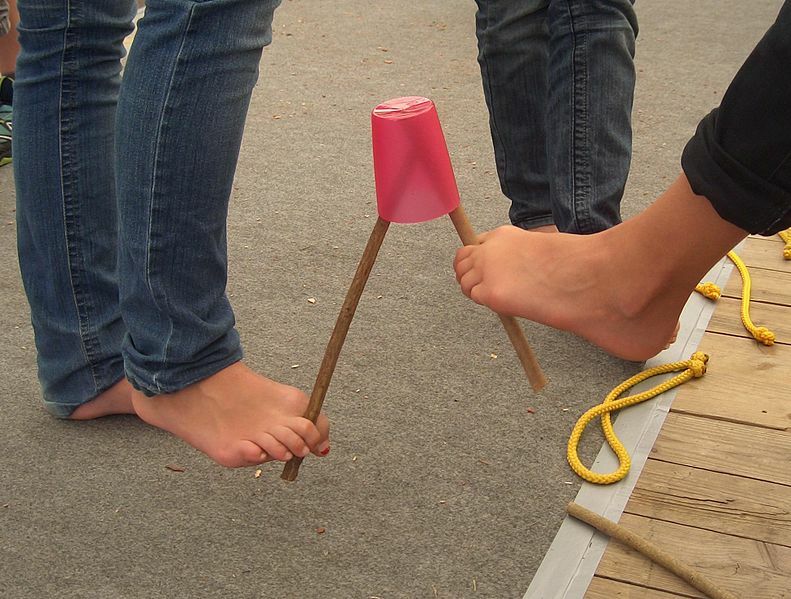 if everyone holds a stick between the toes, a cup can be passed between persons or through a line. This can also be a funny competition! In the same way people can pass a ring. Participants sit on the ground at about one yard's distance and pass a balloon or soft ball with their feet. Even this can again be conducted as a competition of two or three groups. The following exercises are suited as stations of a game circle. 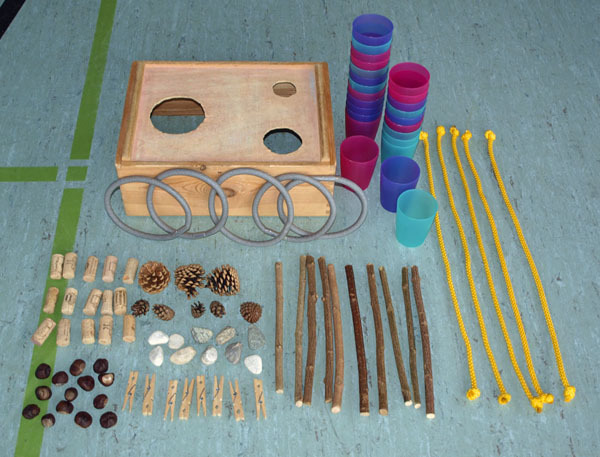 It is recommended to offer one game per 3-4 participants, who go through the circle together. Regular changes are scheduled so that everyone can play all the games. Use cords (about 0.3 inch thick, 3 feet long) with a tight knot at each end. At first, it takes some time to tie a knot with the toes, but with some exercise it works! One can also tie together several cords. If the knot is not tightened too much, one can also undo it with the feet. 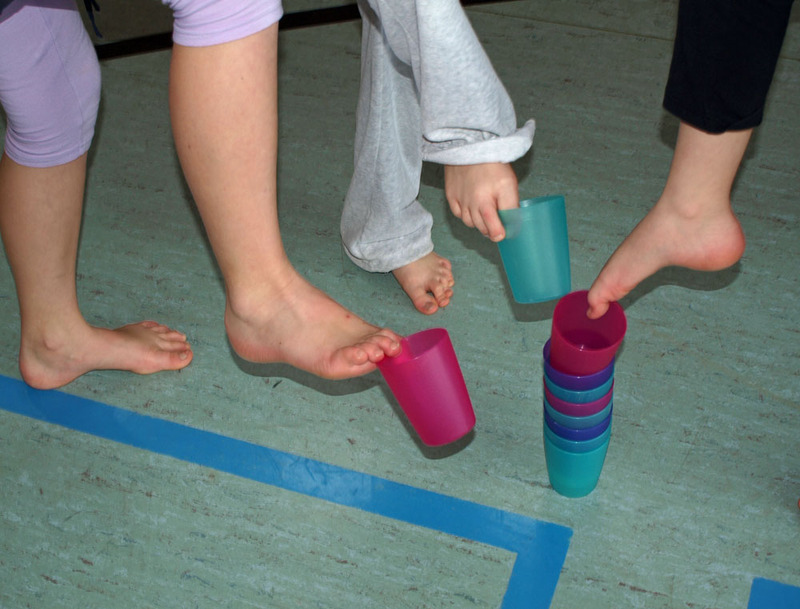 We take cups with our toes and pile them up. We try to build a high stack without bowling it down. Let us find out, if our left or right foot is more skilled! Rather use heavier plastic cups than paper cups, which may be easily blown down by the wind. requires a very calm foot. Approx. 20 straight rods should be available for the game. can be folded with the feet out of a sheet of newspaper. 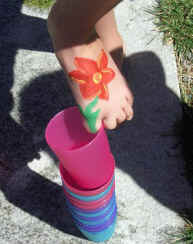 Try to write your name or to paint a little picture with your foot -- and look at the webmaster's first attempt! To leave no traces of paint, you should not use ballpoint or felt-tip pens! Pencils are recommended instead. 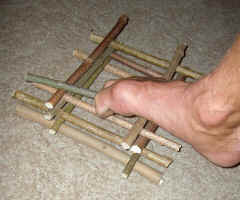 What we can grasp with the toes, can be placed as a mosaic. Thus we need not creep on the ground, but we stand upright and have a perfect overall view of our piece of art! 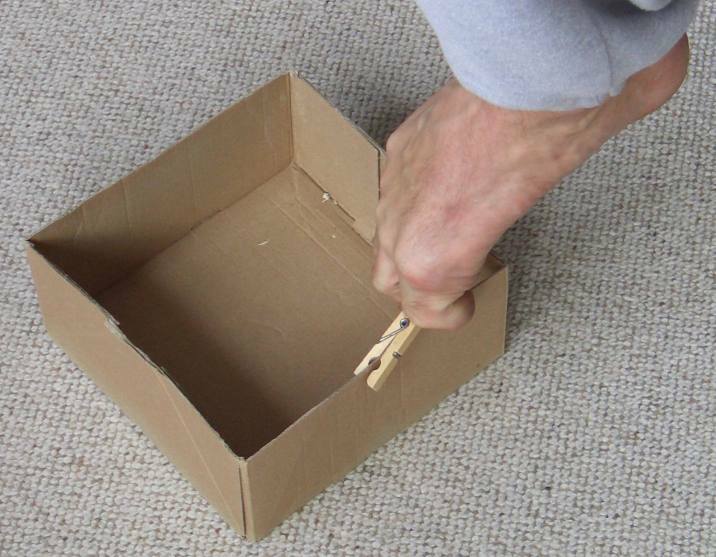 to the edge of a carton with the feet is a demanding exercise, which promotes spatial coordination and strengthens the foot muscles. 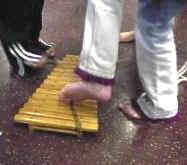 Who can play a melody with his feet on a xylophone or chimes? Participants blow up two balloons, do not tie the ends, but clamp them between the toes and try to walk without losing air. Or they surprise the others by suddenly releasing the balloons! View the videos of going or running this way! 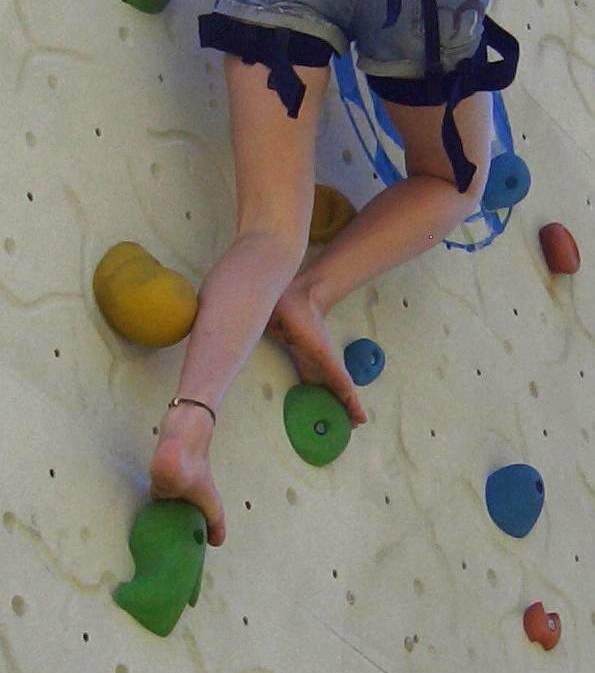 If there is a climbing wall, it can - of course with reliable safety - be included in the game circle. Likewise, one can climb on poles, ropes or wall bars. Martial arts - Judo, Karate, Taekwondo, etc.